Product code: 2426 Categories: Sold Items, Sold Rings. Here is an antique ring with the style and design of not just one ring but two and made in a style that still gives it a modern look all the while set with antique cut stones and being a genuine antique ring. 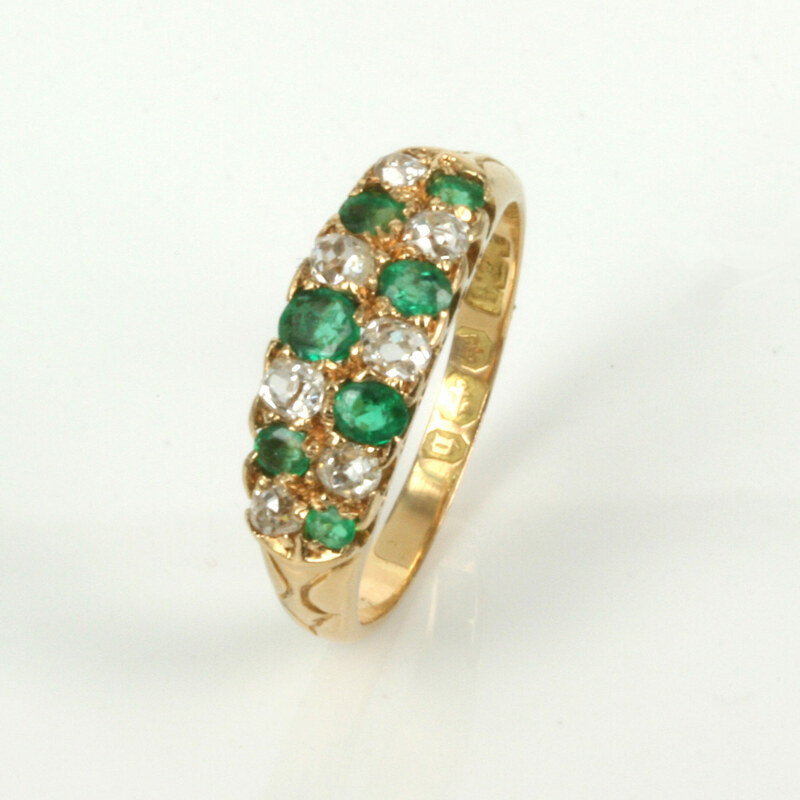 Made over 140 years ago in Birmingham in 1870, this lovely antique ring was made in 18ct yellow gold and as can be seen is set with two rows of natural emeralds and diamonds. Each row is set with three emeralds and three diamonds with each row starting with a different gemstone to give this ring that lovely contrasting colour scheme. From left to right where the emeralds and diamonds start and finish, the ring measures 17.5mm across and at its widest point in the centre, the ring measures 6.5mm wide and combined with the double row look, makes it the perfect ring to wear on its own or stacked against another ring. The old cut diamonds have a total weight of 0.56 carats and the natural emeralds are Colombian which are still regarded as the best quality emeralds in the world, and these total 0.66 carats. To think that this ring was made in 1870 and is still not only in great condition but looks great as well all go to making this a wonderful antique emerald and diamond ring from the Victorian era.